LAS VEGAS – Racing for the first time since the AMA Pro Motocross Championship finale at the end of August, Red Bull KTM Factory Racing’s Marvin Musquin lined up in Las Vegas Saturday night and captured an 11th place finish aboard his KTM 450 SX-F FACTORY EDITION after a challenging night. His newest teammate, Cooper Webb, debuted his orange ride and walked away with a 12th. 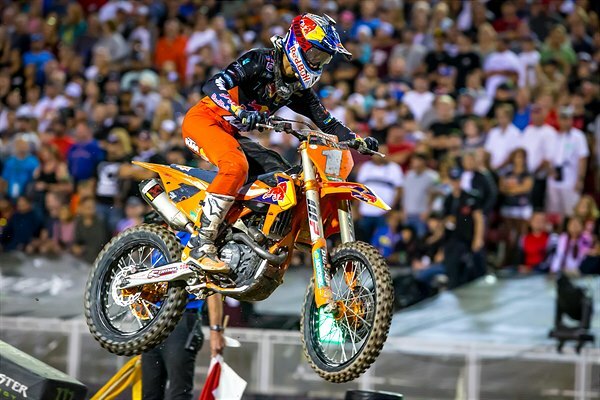 Musquin, the 2017 Monster Energy Cup ::News_LongText:: million winner, qualified first in Vegas and was looking strong to try at a repeat million-dollar performance. Teammate Webb qualified sixth and was ready to make an impressive debut with the team. Musquin was fifth at the start of Main Event 1 then quickly moved to fourth. He made a successful pass for the third-place spot in the third lap then took command of second soon after. He made a calculated decision to take the Joker Lane in the last lap and held strong to finish second. Webb was seventh at the start then made his way to sixth in the fourth lap. He took the Joker Lane with three laps to go and went back to 10thbut worked his way to a sixth-place finish. Musquin was top-five at the start of Main Event 2 and came out of the first lap in fourth. He tangled with another rider under the tunnel in the second lap, remounted farther back in the pack, and worked his way back to a ninth-place finish. Webb went down at the start and was forced to battle it out in the back of the pack. He finished 19th. Webb was mid-pack at the start and made his way to 12thby the third lap. He continued to push and finished 9th. The 6-19-9 finish gave him 12thoverall on the night. Musquin had a challenging third moto and finished 21st. The 2-9-21 finish gave him 11thoverall on the night. This entry was posted in Global News, Moto, Motocross, Motorsports, Offroad, Supercross by admin. Bookmark the permalink.